Aqua Vac's KINGSHARK 2 tackles the most demanding commercial pools and makes even the toughest jobs easier. It's fast and convenient and now is available with the all new AV Twister cord swivel attachment to avoid cord tangling*. The KINGSHARK 2 is fully automatic and completely self contained. No hoses or filter hook-ups required. It completely cleans an Olympic size pool in under five hours! Removable filters rinse clean in minutes. 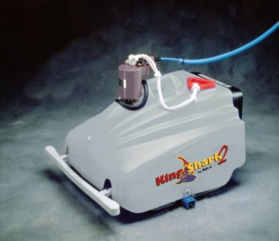 Built to clean, designed to last, it's no wonder the KINGSHARK 2 is the #1 selling commercial pool cleaner in the world. *AV Twister Cord Swivel is optional. Hoist and Caddy Cart are optional accessories.